10 bursaries up for grabs - The Little Event 2017! For people who are relatively early in their STEM communication career, whether they work in a science centre or museum, volunteer for a festival, are involved in university outreach, or do anything else to engage people with sciences. It’s a lot like the BIG Event, but a bit smaller, and all crammed into one busy day. There will be several sessions, each focusing on developing a different skill, delivered by experienced science communicators following our usual hands-on approach. But of course it isn’t just about the sessions, it’s the people you meet there too. The Little Event presents a great opportunity to meet people from across the UK working in similar roles and sharing similar experiences. The programme for the day will include sessions on Learning & evaluation, Interacting with the public, Managing your engagement project, Presenting and careers. Each bursary worth £100 covers an annual BIG membership, registration fees for the Little Event and £25 towards travel expenses. If you wish to apply for one of the 10 free places, applying is simple. Just email event@big.uk.comby noon on Wednesday 16th December with the subject line "Bursary application Little Event" to tell us in no more than 200 words why you would like the opportunity to come to the Little Event and how you think it will benefit your personal and professional development. Successful applicants will be notified by by email. BIG is looking for a self-employed contractor to join its small-but-perfectly-formed team of supporters of BIG’s aims and activities, to improve its service of training provision to members. You will develop and deliver BIG’s Skills Days and – over time – take over the coordination of the BIG Event too. We are looking for a proactive and dependable individual to join our Outreach and Engagement department as a Welsh Support Coordinator. Wanted! 7 keen individuals to form BIG Executive Committee 2016-17! Members of BIG are invited to stand for a position on the 2016/17 Executive Committee. ANY member can apply for ANY position on the Committee and no prior experience of Committee or Board work is required. It's always helpful to have a cross-representation of the entire membership on the Committee so we actively encourage applications from freelancers, science festivals, science centres, academic institutions, zoos, museums, funding and research bodies etc. We are looking to fill all roles but in particular we are looking for a new Chair and a General (Ordinary) Committee member. We are a friendly bunch, we meet about 4 times a year somewhere central to all committee members (for which your expenses will be covered) and you'll be fully supported in your role by BIG's Administrator. You will receive a cost-only place at the BIG Event 2017. All positions will be subject to an online vote and the results will be revealed at the Annual General Meeting (AGM) in Belfast on July 21st (you do not need to be present). Mathematician Katie Steckles has won the 2016 Josh Award. She plans to turn the Museum of Science and Industry into a giant hand-made, crowd- sourced image during this year’s Manchester Science Festival. Katie's winning application suggested festival visitors help colour thousands of individual ‘pixels’ that will make up a picture in one of the museum’s windows representing how digital devices such as computers, tablets, and phones display images. The project will also look at the mathematics behind how devices store images as a series of numbers that create the different colours on screen. There’ll be a close-up look at the pixels in your own phone’s screen and a photo booth that transforms you into an Excel spreadsheet of colour values. The Josh Award is the UK’s national award in science communication, established to recognise and support up-and-coming talent in science communication. The award provides the opportunity to become the science communicator in residence at the Manchester Science Festival 2016, in partnership with the University of Salford, Manchester developing and delivering a new project or event while showcasing best practice in the field of science communication. The winner receives support to nurture their development in the field and their involvement in the Manchester Science Festival from both the Festival team, the University of Salford’s Science Communication cluster, and the BIG STEM Communicators Network. The is the third year that BIG has been co-organising the Josh Award. We saw some very strong entries and choosing a winner was not easy. The award panel were impressed with Katie’s plan for an event at the Manchester Science festival and with her commitment to bringing mathematics to the fore in everyday life. This year BIG is offering 2-3 bursary places which will pay registration fees for the BIG Event in Belfast and give limited travel and accommodation support. This is open to BIG members who are in the first five years of their professional career and have not attended a previous BIG Event. Are you - or do you know - an amazing science communicator who is at a defining moment in their career? The Josh Award is an award established to recognise and support up-and-coming talent in science communication. The award recognises a defining moment in the career of a science communicator; a person who is a practicing scientist or someone who has chosen science communication as their profession. This defining moment could be a game changing project, piece of work, way of working or a key moment of change, creativity, innovation or passion. A defining moment in a career that has transformed science communication practice, inspired others or changed the landscape of science communication. The award provides the opportunity to become the science communicator in residence at the Manchester Science Festival 2016, developing and delivering a new project or event while showcasing best practise in the field of science communication. The winner will receive support to nurture their development in the field and their involvement in the Manchester Science Festival from both the Festival team and the BIG STEM Communicators Network. Registration is now open for the BIG Event, Wed 20 - Fri 22 July at W5 Science Centre in Belfast. The BIG Event is a three-day conference offering an unmissable opportunity to squeeze the skills and ideas out of all the STEM engagement people you can in a short space of time. 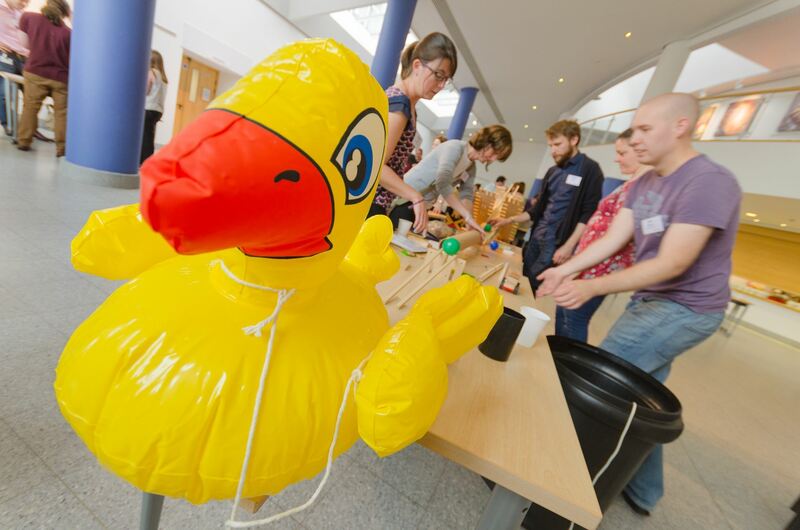 The BIG Event is relevant for designers, presenters, educators, students, front of house staff, evaluators, educationalists, funders, and anyone involved in public engagement with science, technology, engineering and maths (STEM). Many people working in the STEM engagement field have little opportunity to cross paths with their peers, so the BIG Event was designed with exactly this in mind. Low cost flights from Flybe, RyanAir, Easyjet available from all UK airports to Belfast City or Belfast International Airports. You can find out more about the Award and the simple application process here.